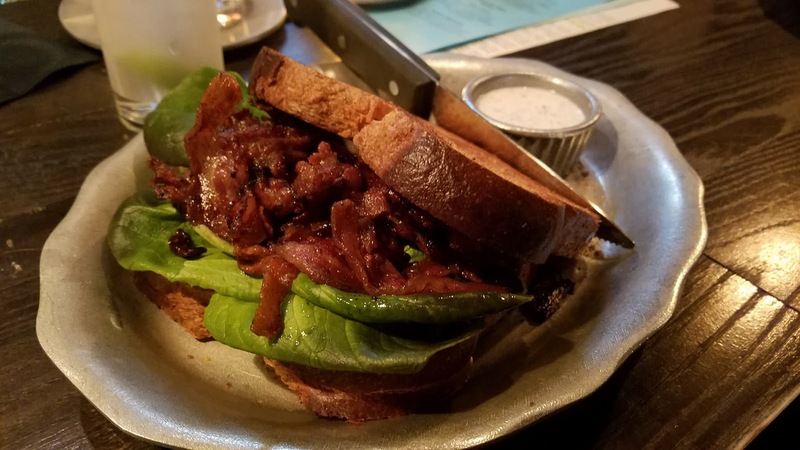 We've been meaning to stop by Joebar ever since it opened its door in Hazel Park last March. The unassuming space serves up original cocktails, dip sandwiches, and cold beer. Their finely curated menu features soup, salad, a few sandwiches, a few sides and a couple of dessert options, but it also somehow seems to have something for everyone. 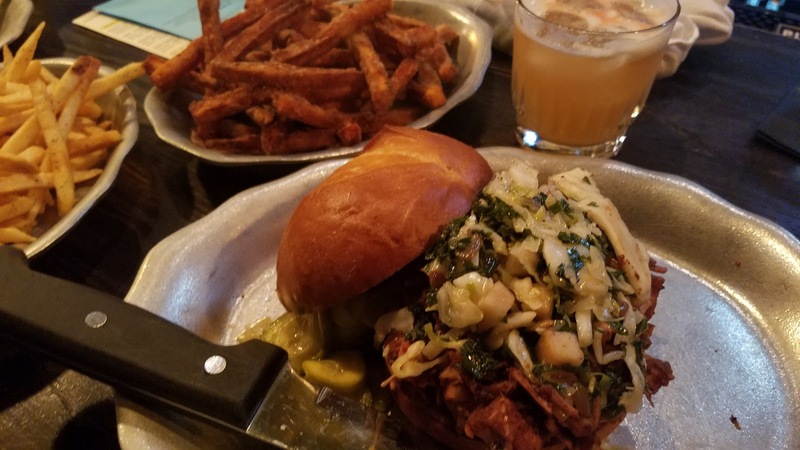 Personally, I wanted to stop int to try their BBQ Jackfruit Burger. While many restaurants are beginning to offer a vegan option on their menus, few are stepping outside the comfort of a black bean or impossible burger. This restaurant features open seating and patrons can take a spot anywhere they can find a table. That means that there is a good chance that you might be sharing a table with another couple and you might have to spend some time hanging out at the bar before you can get a seat. But don't worry, they let you grab a cocktail while you are waiting and have a few couches and chairs to make you more comfortable while you do. We were lucky and immediately scored a spot at the bar where our server promptly gave us menus and explained how things worked. We started the night with a round of cocktails and I was delighted by their cider cocktail feature that included McClary's Drinking Vinegar and while strong, it went down way too easy. 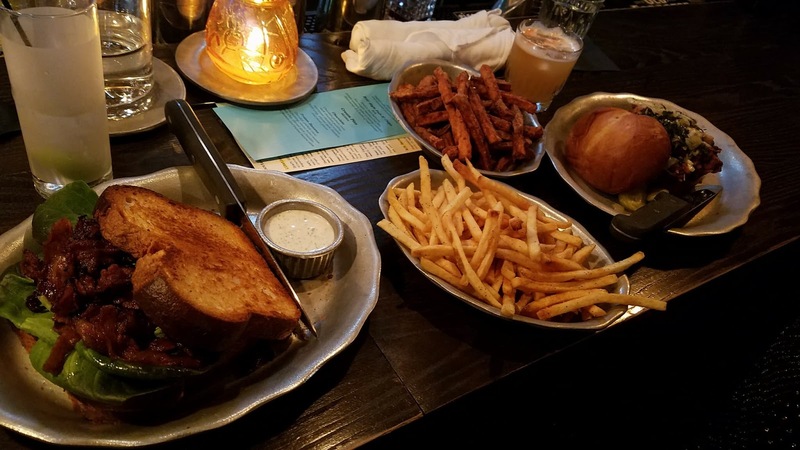 For our main meal, we each ordered a sandwich with both regular and sweet potato fries on the side. My Jackfruit burger was more delightful then I could have ever imagined and the fries, while salty, were also delicious. They were just a little well done and crunchy, exactly how I like them. The house fries were skinny and long while the sweet potatoes fries were fat and short, I liked both, but would definitely go with the sweet potato fries if I had to choose. 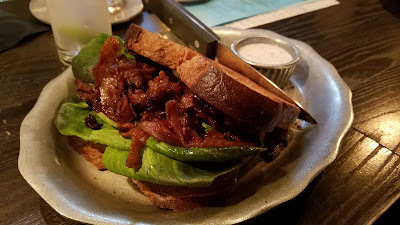 My dining mate enjoyed the BLT with avacado and tried a bite of my sandwich out of curiosity. After she sampled both she declared that when she came back she would definitely be ordering the Jackfruit sandwich, despite her love of meat. We both grabbed a second round of drinks and couldn't finish all of the food that we were given. When the bill came I was even more pleased to find out that the drinks, food, and sides were all very reasonably priced and two specialty drinks and a full meal only cost me around $30. 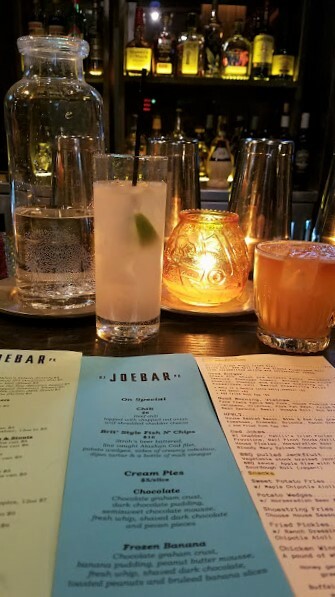 I would highly suggest visiting Joebar the next time you want to have a good drink and unique meal in a low key place with solid service, alcohol, and desserts! 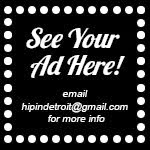 Joebar is located at 23839 John R. in Hazel Park. The bar also features special menus and events, you can keep up with what they are up to here.